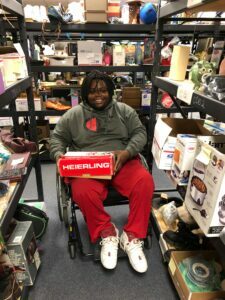 Homeless and recently graduated from high school, Josh came to Goodwill of Greater Grand Rapids looking for stability. He was bouncing from shelter to shelter, searching for a sustainable job and steady housing. That’s when he heard about Goodwill’s ASSETS program, a program for young adults with disabilities transitioning from school into employment. With this new drive, Josh began to reapply himself. He sent his resume to several organizations, but with little work experience, he wasn’t having much success. Josh was feeling like he was hitting a wall. That is, until Josh’s career coach set up a temporary work experience within Goodwill’s ecommerce department, ShopGoodwill. The paid work experience was three months long to help Josh build his resume. Not only did Josh gain skills and experience, his positive attitude and work ethic led to a job offer from Goodwill. It has now been two years since Josh started working in the ecommerce department. He recalled, “At the end of my temporary position, my bosses sat me down and told me I was a perfect fit for the department. Thanks to Goodwill, I received so much help. It was a long process. I was coming from a distance and there were times my career coach had to pick me up, so I could make it to certain places. They even gave me bus tickets. 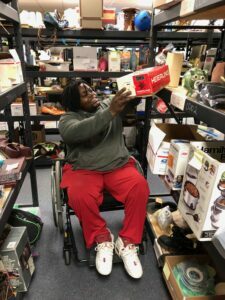 I can honestly say to this day, Goodwill has been one of the best things that has happened to me.” Ecstatic to be fully employed, Josh was able to help his family get a home and out of their previous situation.